The 1987 Yamaha Moto Four 225 for Trade ONLY has a new battery, runs good and the tires in in OK condition. The Moto Four runs good and has good power. I lost the key to the ATV but it still starts. If you have any questions about the Moto 225's condition or features you are welcome to contact me using the space below that has been provided by GoGoCycles Used Yamaha ATVs for sale (and PLEASE do include your contact information in your email or to provide a phone number or email address!) so that I can respond with answers to your questions about the ATV as quickly as possible. 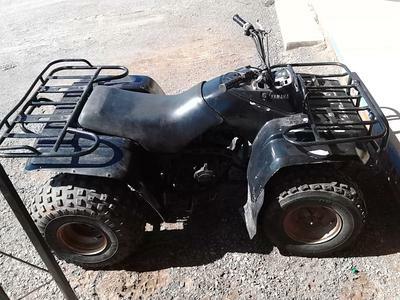 In my opinion this ATV is in good condition for its age and there is most likely not another one is nice for sale in OK Oklahoma USA as this one so hurry and make an offer before it gets away from you! The 1987 Yamaha Moto Four 225 for Trade is in Burnsflat Oklahoma OK USA and your review and opinions are always welcome to make individuals that might want to buy aware of any problems that are commonly associated with the 1987 model ATV or to highlight its positive features. I want to trade for a 125 to 250 dirt bike manufactured in around the same year as this used ATV. If you have a dirt bike that you want to trade for the Moto call me (no e-mail) at one five 80 three 74 seven 32 six. Join in and write your own page! It's easy to do. How? Simply click here to return to YAMAHA ATV CLASSIFIED AD .